Once a derelict, now a graceful holiday home deep in the green of a hill of one of the most beautiful natural reserves of Italy! The colours and the sounds of nature rule over the landscape and diffuse a sense of peace and tranquility that only nature can provide. The holiday home is made up of two apartments, each one jauntily colorful, decorated with taste and elegance and embellished with some ceramic works from Vietri. Big windows give the chance of enjoying the sight also from the comfortable living rooms inside the apartments, during winter as well as summer. Halfway between inland and the sea, this is perfect both for who loves the beach and who loves to walk through the fields or lay under the shadow of a tree. 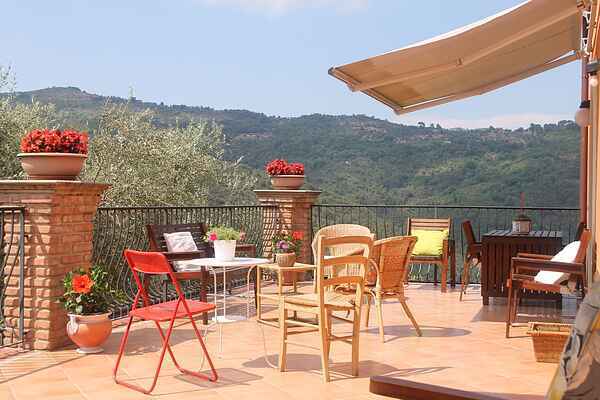 Book your holiday now, the Cilento region will be happy to welcome you. By agreement with the owner you can bring your pet, however, you are kindly requested to keep them only in the external areas of the house (terrace and garden), as the apartments are not suitable for hosting them.